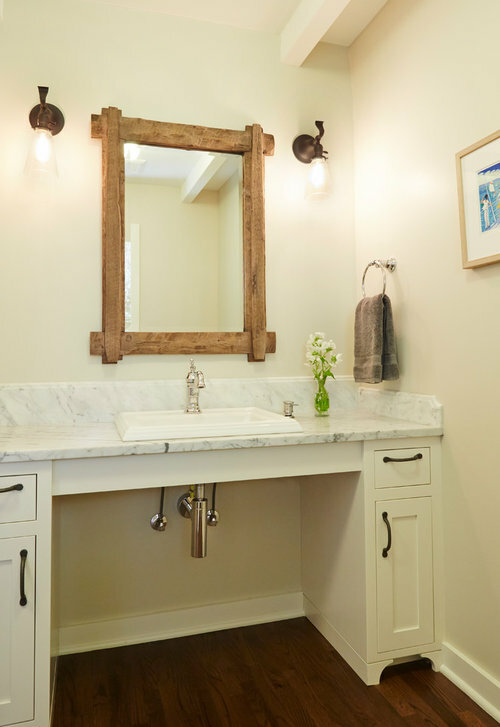 I was interested in sink/vanity. Would it work with wheelchair? 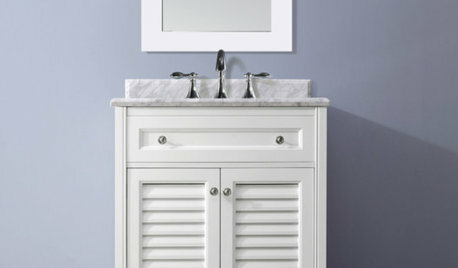 I was interested in sink/vanity. Would it work with a wheelchair? Wher can it be purchased? Thank you for your information and time. Yes, I designed it to work with a wheelchair. It is fully custom made, though, and not something you can purchase. Lever dorrknobs on all doors and faucet handles make it easier for arthritic hands. Also "D" shaped cupboard and drawer handles, mounted horizontally. Rocker style light switches are much easier, and you might want to consider lowering them so a seated person can reach them easily. Adapters for lamp switches, keys, and so forth can be found in many health products catalogs. 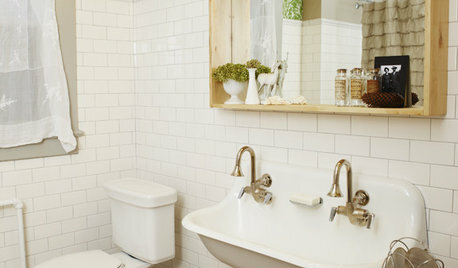 Houzz has good photos of showers with no curbs, with beautiful handrails. If you build a new toilet area, leave room on each side for an assistant. 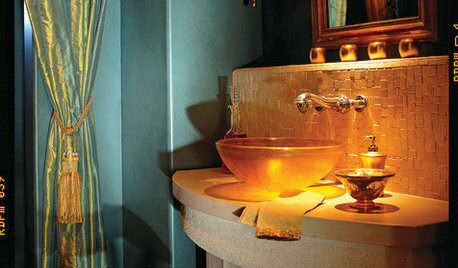 A "wet" room can also be an option- it looks like one has a spa in the house! Fully electric beds do come in queen size. One can order a memory foam-type or pillow-top mattress for the bed, and many can be purchased locally. It is good for someone who can not turn over in bed, but can roll over (need more space). A twin size bed is easier for assistant(s). I person is vision impaired, add a a row of small lights along both sides of hallways, like at the movie theater, in addition to lighted steps on stairways. 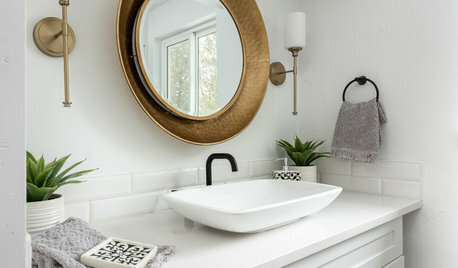 In the bathroom, add a course of 1/2 to 1 inch reflective tile in the shower (ex: glass tile with a metallic gold powdery glitter back) for contrast around the edge of the built-in seat, the faucet control, the drain). Also consider the sink area. Do not have any highly reflective flooring or other surfaces that will cause glare. In the kitchen, have high contrast borders on countertops. It is very frustrating to "almost" get the bowl on the counter because one can not see where the edge is. If the counters are dark, get light colored dishes. There may be certain colors that are easier or harder for the person to see. Ask! A ramped entrance to the house is a good idea. There are also "walker steps" with a short rise and a tread deep enough for a person using a walker/walking frame to mount completely before taking the next step. 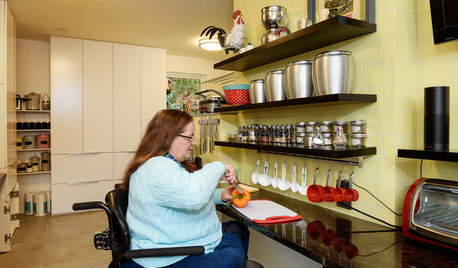 There is a Houzz discussion about "new paraplegic in the house," and many ideas are being generated there. Some good ones on door width needs, hardware to retrofit a narrower door, and and so on. You ladies are wonderful! Thanks for your interest. First, Rhonda, some background: Our ground-floor tenants of forty years moved out and my husband and I would like to move my parents from their multi-story apartment a few blocks away into the empty apartment, where they can be relieved of walking the stairs, and where we can be there if they need us. Cost definitely is a concern. The apartment is in deplorable condition and must be gutted. Somehow the tub and toilet unit and the bathroom tile have survived and might be saved, although the tub/shower faucets are held together by wire! The rest of the apartment -- even the flooring -- is unusable. My parents also need a second bathroom, with the space taken from the guest room. The current bathroom has a tub, which my mom needs. This bathroom need not be accessible. TubOrig.jpg depicts how it looks today. We might have to make this room smaller because we can’t make the guest room so tiny as to render the apartment virtually unrentable down the road. 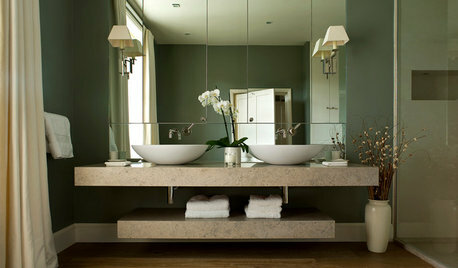 Yet I still hope this bathroom will be somewhat comfortable and pretty, with the toilet not too close to the vanity. Which of these three choices would you recommend? •TubV1 – Guest room 11’7 x 9’8”. 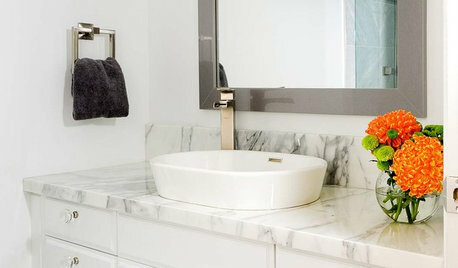 I'd just replace the vanity and the tub/shower faucets, but otherwise leave the room unchanged. •TubV2 – Guest room 12’7” x 9’8”. 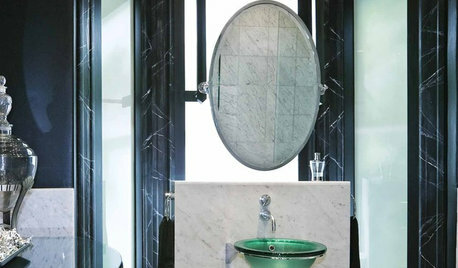 I'd leave the toilet where it is, but move the vanity 1’ closer. Would this choice enable us to remove one foot of the (small) tile, instead of replacing all the tile? Any idea how much more expensive this might be than TubV1? Can the door still open inward? •TubV3 – Most expensive choice but nicest bathroom (I think!) Guest room 12’7” x 9’8”. 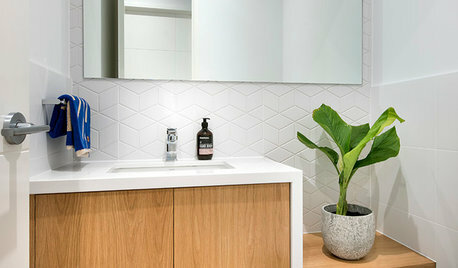 Move the toilet and vanity, replace all the tile. I don't know how much this would run us. Can the door still open inward? For the new bathroom, I care less about aesthetics and more about functionality. My dad is likely to need an accessible shower before long. A roll-in one is best, but we’d be willing to maneuver over a curb if need be. Would ShowerV1 work? Could it be a roll-in shower? Should the bathroom door open inward or outward? We prefer no pocket door. Also, would be able to get a wheelchair (not with wide turns, but with some back and forth maneuvering) into the bedroom, guest room and back bathroom? The kitchen eating area and the living room need to be accessible, too. The front bathroom and the kitchen work areas (counters and sinks) don’t need to be accessible, and the study is optional. BTW, my mom hates that today anyone can see straight into the eating areas from the open apartment doorway. Also, people coming to visit in the living room enter the apartment facing a wall just 3' away. 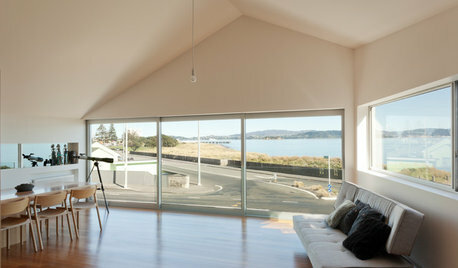 Only after coming around the door do they face the open area of the dining/living room. That feels awfully cramped. So I drew the kitchen turned front-to-back so you can't see the kitchen table from the doorway, added a folding door at the dining/living room entrance to block the view of that room when desired, and reversed the direction of the door so formal visitors first see the living room area instead of first seeing the wall. I’m concerned that, when walking from the door to the kitchen, it would be even more claustrophobic than it is now, as one would face folding doors on the left and 6 1/2 feet of blank wall straight ahead. The ceilings are only 8’ high. Is there anything more I can do? Would it help to have that 6’7”-long wall be only 6’ high? I’ll email you copies of the jpg files, as you so kindly suggested. Thank you so much, Rhonda, for taking the time to look at these. WINDOWSA Window Above the Bathroom Sink: Feature or Flaw?